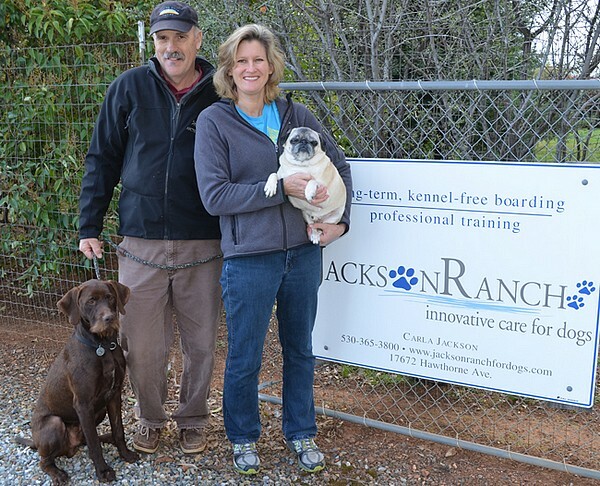 Jackson Ranch is a positive experience for owners and a pleasurable learning experience for their dogs. We are not a mass-boarding experience. At Jackson Ranch, your dog won’t be confined in chain link and concrete kennels filled with barking, anxious dogs desperate for freedom and attention. Instead she will spend most of the day playing with friendly peers or relaxing in climate-controlled comfort. Owners Carla Jackson and Mark Olney live on site and work hard to ensure that your dog will thrive in our relaxed, home atmosphere. Our training philosophy is based in positive reinforcement. Pets benefit from reward-based training and daily routines that capitalize on the dog’s natural instincts. We believe every dog deserves a chance to be the best s/he can be and at Jackson Ranch for Dogs, we set the dog up for success. Effective dog training does not have to resemble a canine version of boot camp. In fact, the more fun it is, the better the results will be for both dog and owner. Learning to administer treats and praise to reward appropriate behavior leads the dog to believe that doing what’s asked is the best option available. Jackson Ranch is fun! Dogs have access to 2 securely fenced, shaded and grassy acres. We offer six different yards where dogs are matched in compatible play groups. One yard hosts our senior or quiet guests who enjoy the company of people and prefer napping over exercise. Our adolescent zone provides plenty of room to run and play under the watchful eye of our staff. We monitor the play, much like a teacher with playground duty to ensure the safest, best social experience for our young, high-energy guests, the next best thing to being at home.